"Dying together is even more personal than living together." Manufacturer: Panasonic Disc Manufacturing Corp.
During World War II, U-boats frequently sank ships and the survivors were forced to try to make their way to rescue in lifeboats, often remaining at sea for many weeks. John Steinbeck was asked to write a story on this basic tale, ripped from the headlines, and it his novella that forms the basis for this Hitchcock character classic. This was Hitchcock's only film for Fox, being out on loan from Selznick, and its release on DVD completes the releases of Hitchcock's Hollywood films on that medium. Notable as one of Hitchcock's first major technical experiments in Hollywood (he had earlier spearheaded sound films in Britain), it's also a memorable portrayal of humanity under severe stress. Hitchcock begins almost immediately in the title lifeboat; a freighter (seen only in the form of its smokestack) sinks during the opening credits, torpedoed by a U-boat, but before it sinks it manages to shell the submarine as well. A long pan of the detritus of the wreck leads us to photojournalist Constance Porter (Tallulah Bankhead), dressed to the nines in minks and jewelry, alone in the lifeboat. That doesn't last long, however, as sailors Gus Smith (William Bendix), communist John Kovac (John Hodiak) and Sparks Garrett (Hume Cronyn) join the boat, as well as nurse Alice MacKenzie (Mary Anderson), shell-shock victim Mrs. Higgins (Heather Angel), industrialist Charles Ritterhouse (Henry Hull) and steward Joe Spencer (Canada Lee). But the most distressing addition to the boat is a German sailor, Willy (Walter Slezak), who may be the captain of the U-Boat that sank them. Tensions soon rage as they battle the elements and each other in a confined space, short on food and water and adrift without a compass. 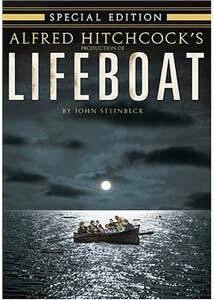 As has frequently been observed, the cast of the lifeboat is a microcosm of society, from servant to upper class, from laborer to white collar worker. Accordingly the cast is subject to human failings such as jealousy, suspicion, distrust, secrecy, prejudice, and rage. When the food runs short, basic human decency begins to run short as well, leading to suicide and murder though stopping short of cannibalism (which surely would never have been tolerated by the Hays Office in any event). Conflict is inherent from the beginning, as they debate whether to fling the Nazi from the boat, and continuing as they are unable to decide what their bearings should be. The reactions of each of the different characters to these different conflicts helps make the film what it is, with the characters playing generally true to type (e.g., the industrialist is more than willing to work with the Nazi). The three principal characters are the most fascinating. Constance Porter has the greatest development in the film, moving from self-centered and materialistic snoot to a passionate, vibrant human being (as difficult as it may be to imagine iconically cold Tallulah Bankhead as the latter). Bendix's Gus Smith is one of the most pathetic, as he longs for his girlfriend Rosie, who is mad for dancing, especially as he faces the necessity of losing his leg due to gangrene. Drifting between coherence and madness, he is riveting in his sincerity and his desperation; an interesting aspect is his name change from Schmidt to Smith, the embarrassment over which causes him to resent the German on a very personal basis. But it is the Nazi who is the focus of much of the film, and his characterization provides most of the drive in the story. Interestingly, the film was panned on its first release in 1944 for providing a sympathetic portrayal of Willy; with modern eyes he seems to be painted as a stereotypical Nazi with few actions that are anything other than selfish and vile; even his willingness to save Gus by performing the amputation is driven by a desire to ingratiate himself with the others and earn their trust. Slezak combines the iron Nazi sensibility with some jolly gemütlichkeit to help make him at least plausibly not thrown from the boat at the first instance. The critics who thought Slezak was presented too sympathetically, however, either didn't stay for the end with its call for extermination of the German people, or were just blinded by wartime fervor. The experimental nature of the picture is evident from the restricted setting. Hitchcock makes an effort to never have the same shot twice, requiring an immense amount of prior planning and technical ingenuity. This results in some truly beautiful images, including the silhouetted sequence where Mrs. Higgins' infant is buried at sea to the 23rd Psalm, first half-remembered and butchered by Ritterhouse and then taken over confidently by the spiritual Joe in one of the most truly religious moments in all of Hitchcock's films. He also uses light and shadow to excellent effect, such as the shadow of the sail shifting over Willy's face as his thoughts simultaneously darken towards the others. Even though rear projection is usually pretty awful and unconvincing in most Hitchcock films, it's quite well done here and most of the time, combined with the rocking of the boat passes well enough for real. Without this distraction, we're able to focus on the human drama, and the result is one of the most intriguing in Hitchcock's catalog. Image Transfer Review: Considering the wartime circumstances under which this was shot, it looks pretty good. Apparently all surviving materials have some mild nitrate deterioration during the opening titles, but it's not too bad. There's a ton of grain but it's well rendered and not sparkly. The picture is a little soft, but that really helps the rear projection from standing out too badly, and may well be intentional. The next to last reel seems to be very contrasty, with one important shot of Gus' shoe quite illegible. Audio Transfer Review: Both mono and stereo English mixes are presented. The mono sounds fine, with little noise or hiss. The stereo mix works to good effect, especially during the storm sequences. It's not exactly enveloping but it does provide the desired impact and feeling of dangerousness. Annoyingly, the audio tracks are not switchable on the fly, for no good reason. Extras Review: Dr. Drew Casper provides a breathlessly enthusiastic appraisal of the film in the commentary, which contains quite a few incisive and insightful remarks from him, though he tends to peter out after the first hour or so. He also makes an appearance in the supporting documentary, along with Hitchcock's daughter and granddaughter and a Steinbeck scholar who comments on the differences between the original novella and the film. Both special features are quite good though they cover much of the same territory, including the salacious tales about Bankhead's refusal to wear underwear. Finally, there's a reproduction of the presskit, billed here as a 'still gallery.' It would have been nice to see a trailer for this from its original release, but there's none here. Hitchcock's all at sea, and the resulting character drama is riveting. The transfer is acceptable considering the state of the elements, and there are some enthusiastic extras in support.